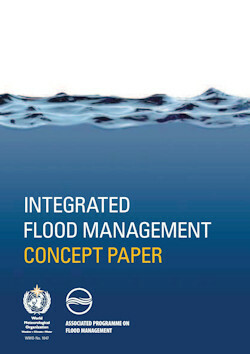 Integrated flood management (IFM) calls for a paradigm shift from the traditional, fragmented and localized approach, and encourages the use of the resources of a river basin as a whole, employing strategies to maintain or augment the productivity of floodplains, while at the same time providing protective measures against losses due to flooding. Since IFM is essentially a dynamic notion, the perception presented in this third revised edition also includes a number of emerging issues, such as risk management, urban floods, climate variability and change, and adaptive management. I thhink it is helpful for us. Excelente documento para el manejo de conceptos macro, utilísimo para quienes tomamos decisiones, gracias!